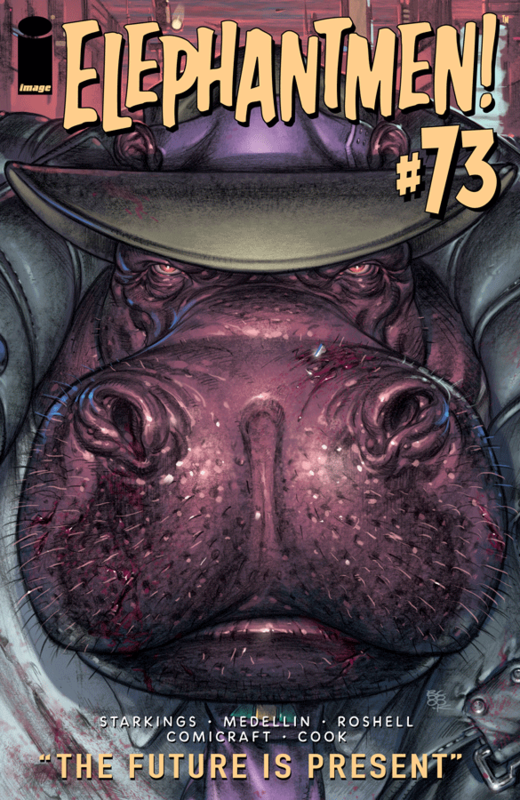 Following on from a beautifully crafted Elephantmen #72 Richard Starkings and the team return for a new chapter in the Elephantmen with issue #73 which is part on of Up Close and Personal. I’m not sure how they have kept such a high standard of comic crafting throughout the series, it’s been consistently good. Most comics seem to have high points and dips but Elephantmen has always drawn on the best bits sci-fi and never lets the fans down. In this issue we touch on time travel, what would you do if you met yourself from the future? Hip Flask’s animal instincts kick in and he deices to fight his slightly older self. I love the world the artists and writers behind Elephantmen have setup over the years, #73 features another amazing cover from Boo Cook along with artwork from Axel Madellin both have helped craft a Blade Runner style future setting. One thing I’ve learnt from reading Elephantmen over the years is a real respect for how different artists have their own style. You get a lot of comics which insist the artists follow a certain style but I think Starkings has encouraged his artists to use their own style and has used each one to help compliment each issues story. Then you get a comic which has a story and artwork which are in such close synergy you get a template for a real masterpiece which all comics could follow. As we head towards the big #80 I’m expecting something big to show up in the series, possibly the return of Nikken, Giant Panda mutants, aliens or maybe an army of Miki clones each with their own super power. Who know’s what will happen, the only thing we can be sure of is it’s going to be unmissable. If you’ve been wanting to catch up on Elephantmen there are numerous good jump on points but I’d recommend starting from the beginning, there are some beautiful collected volumes in the series.